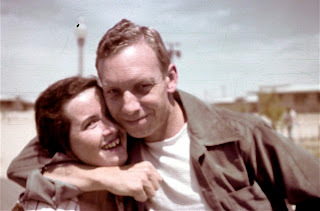 Today was my parents' 60th wedding anniversary. For the past few years, I've been sending my mom anniversary cards with images from my dad's slide collection. This year's card has a photo of my parents in the Mojave Desert, where they worked on a Navy base during World War II. Converting my dad's slides to digital images was one of the best moves I ever made (it was something like 20 cents per slide). I've resolved to take more photos this year, and to record more audio and video, so I can give people truly personalized gifts next year.